I’m sure there are a lot of you out there that enjoyed the Pixar movie Up. I thought it was so sweet, so when I saw this image from The Cat’s Pajamas sweet new set Bunnies in Flight, I had that Up theme in my mind. 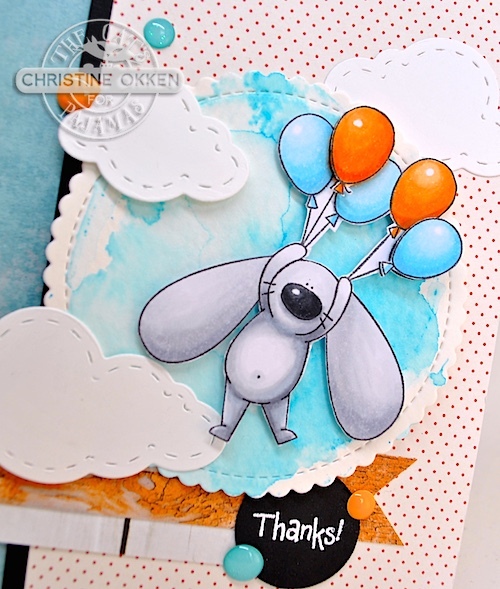 As I perusing some inspiration I also found this adorable card by Barbara Anders, with the sweetest colour palette and layout and I CASED quite a bit of her design for this one, flipping it around and changing some of the elements using what I had on hand. After colouring our Carl inspired bunny with Copics, I popped a couple of the balloons up, trimmed him out and placed him on a watercolour paper scalloped circle that I had smooshed with some reinker and an acrylic block. I added some Stitched Clouds CutUps, the sentiment from TCP’s set Small Sayings, and then accented with enamel dots. I think he looks pretty adorable! I love his chubby little belly and that cute belly button! 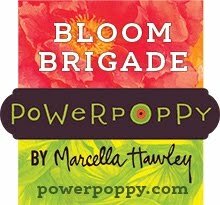 Have you heart about our May Blog Hop at TCP? You can enter to win a $50 prize from The Cat’s Pajamas just by creating something with your TCP goodies! There’s just so much good stuff in store! Absolutely adorable - love the colors especially. He is just adorable!! great coloring and love the stitched clouds! Wow! This is adorable! I love the movie Up!